Software maintenance cover. Is it just money for old rope? When everything’s going swimmingly, it’s easy to question whether the money you’re paying for ‘maintenance’ on your software is actually a good investment. That is until something changes. That something might be a change in headcount – you want to add more users and need active upgrade cover to do it. It might be your IT company recommending an upgrade, such as moving to Exchange or Outlook 2019, which means you need to also update other applications too. It might be a change totally out of your control such as the introduction of GDPR, or the continuing epidemic of malware attacks that makes it more critical than ever to have the most secure versions available. Should you renew? A rule of thumb. If you’re unsure whether maintenance is worthwhile, a good rule of thumb is to think about the implications of that software either being compromised or not available at all. If it’s important to your business, even if you’re not fussed about necessarily having the shiny new headline features, you really should be keeping it up to date. Now with MailStore, if you get in there and renew before it expires, they ask you for roughly 25% of the new price to stay on the latest and greatest version and to have access to technical support if you need it. Compare that with cloud-based alternatives where the figure is the same month on month, it’s very competitive indeed. Particularly as you’ve already spent the initial upfront cost. The only slight snag here is that if you miss that and go beyond the expiry for whatever reason, the cost of renewing rises to 70% of the new price. There is a small grace period, but after that, as you can imagine, on some larger licences it can work out quite expensive to get back on track. So what about this offer? 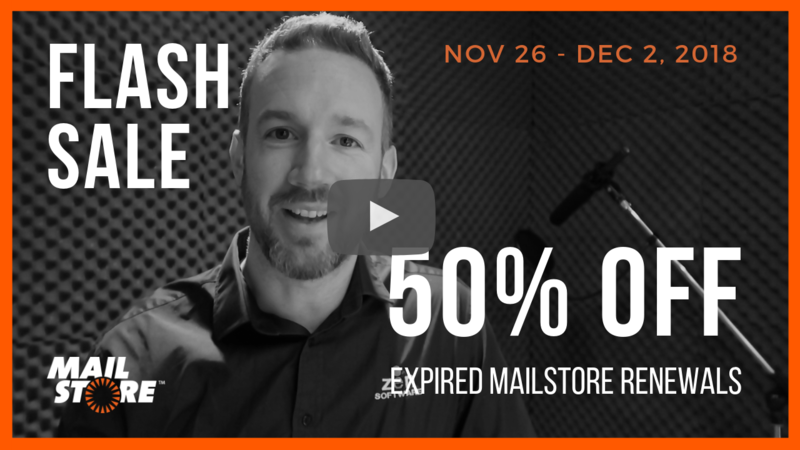 Well, if you still use MailStore but you’ve managed to fall out of the loop for whatever reason you’ll be pleased to know that for a very limited time we’ll be running a heavy discount offer. A ‘flash’ sale if you will! Beginning on Monday 26th November and for a period of 7 days only, if you renew your expired licence we’ll automatically give you a massive 50% off the cost to take the pain away of bringing your software up to date. Just to give you a taste of what’s new, the latest version includes full encryption for every aspect of your archive, GDPR retention policies so you can ensure you’re not keeping messages longer than you should be, new reporting features and a beautiful new web access client which I’ve created a separate video for here. Are you getting the most from MailStore? If you’re not totally sure if your MailStore is set up correctly, or just need a refresher on how best to use it don’t hesitate to get in touch with either us or your MailStore reseller as we’re more than happy to help. 1) Don’t have the key to hand? Go to your ‘Registration keys’ page (login required) where you’ll see details of expired keys. 2) Got the key available? Head over to the ‘Upgrade checker’ page on our website where it’ll show you pricing information based on your key status. Please note, discounts will only be shown when you add an item to the basket and not won’t be displayed outside of the promotional period. Your order needs to be placed before midnight on 2nd December, don’t miss out!